Your Monthly Resource on Power Transmission and Motion Control. PTE's monthly e-newsletter brings you highly targeted information on mechanical power transmission and motion control. The February 2011 issue focuses on custom gear manufacturing. If you're looking for suppliers of Gear Manufacturing Services , there's no better place than in our online Buyers Guide. Also visit the buyers guide to find Custom Gear Manufacturers or suppliers of Stock Gears. In this e-news exclusive, senior editor Jack McGuinn catches up with a handful of custom gear manufacturers to find out what goes into determining their lead times. If you're a buyer of custom gears or gear assemblies, this article should give you insight into how to get the most from your suppliers...Read more. The Preloaded Double Pinions, PDP, from Redex Andantex is designed to provide a cost effective method of eliminating backlash between the rack and pinion in high precision linear motion applications. The PDP is made of two ground WMH pinions, each 1/2 the width of the rack, connected together through a patented coupling, preload system that cancels the backlash between rack and pinion providing a competitive alternative to ball screw drive systems. For additional information visit our web site www.andantex.com or e-mail us at info@andantex.com. Do you need to stay up-to-date on the latest technical aspects of gear manufacturing? PTE's article archive provides a great resource. Here are some of our editors' picks for recent motion control articles that might be of interest. 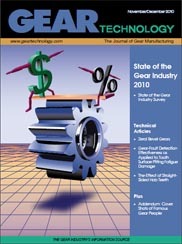 If you're looking for technical information related to gears, you'll find it in Gear Technology. From design engineering to manufacturing, heat treating, inspection and use, Gear Technology covers every aspect in the life of a gear. See how other engineers have solved common gear drive application problems in these editors' choice case studies from previous issues of Power Transmission Engineering.